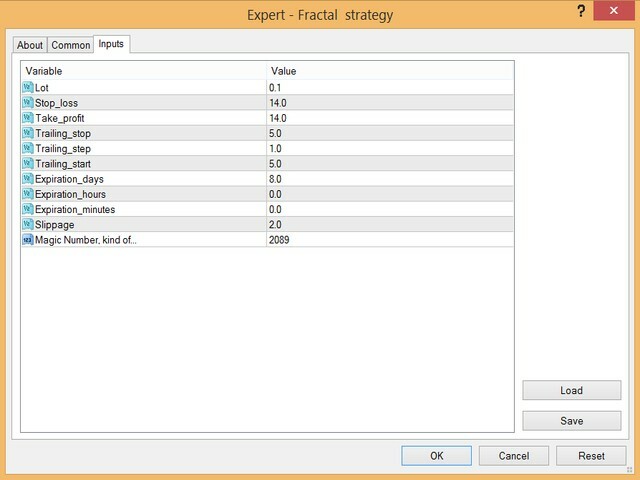 Fractal robot is working with classic Fractal indicator. Fractals data is used from several time frames in this way robot put a pending order at more reliable level and hold it 8 days. If order wasn't reached it will be deleted. The strategy is simple but very reliable. 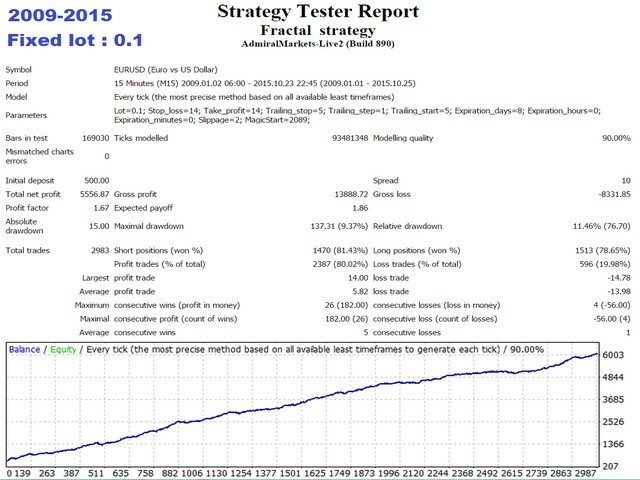 Works stable without martingale,grid or hedge,also there are no big stops. It best works on EURUSD 15 minutes chart. Stop loss - Take profit ratio is 1:1 ( sl14,tp14). Best work on EUR/USD 15 minutes chart. It is recommended to use a low spread broker and a VPS. Download history data before testing on strategy tester. I suggest start trading from 0.01 lot. Default settings is optimazed, use it. Just choose your fixed lot for trading,default lot is 0.1. 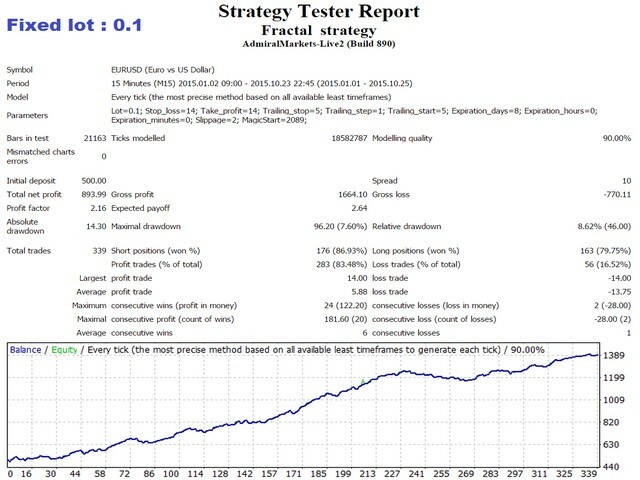 I have been running Fractal Strategy on USDJPY on a demo account since the beginning of the year https://www.mql5.com/en/signals/254905 and over the past month running on live accounts. The results on live accounts are identical to the demo account so very pleased with that. The subscribers to the demo account seem happy except for the one reviewer who gave one star! I run standard settings so very simple to set up. I cannot comment on performance with different brokers. I hope someone reads this. Motivated by Paul. This is the first time I run it in live account and have more than 1% up with one trade. This EA is worth much much more, at least 15 times more. I like this EA, with the good broker is profitable. All the backtest I did are ok. The test in demo I did are ok but not with all the brokers. Right now I'm having nice result with OctaFx and Pepperstone. I tested this EA from March 21 to April 18, 2016 using an Activtrades Account. First parameter (Risk) was set to 1.0, the other parameters were standard. Unfortunately this 1st parameter is not documented. In the documentation the 1st parameter is "Lotsize", which doesn't exist in reality. Also the forum (Comments) seems to be dead, the last contribution by the author is 2.5 month ago. The EA made 26 trades with a total loss of 332 points, so an average loss of more than 12 points per trade. This is worse than arbitrary trading. The only positive I can say about this EA is, that it is cheap to hire, so you may do your own tests with little risk. I just bought this ea. I requested to make some amendments from the seller and he did it promptly without any charge. I give 5 stars to his supporting services. On the performance, so far there were 3 trades and all are profitable. It is still too early to just its performance but I have confidence in this ea because of its trading strategies. With tight stop loss and efficient trailing stops, I did not hesitate to run it on my live accounts as soon as it was delivered to me. I know my accounts will not be busted because it is a safe ea. The version 1.2 has money management instead of a fixed lot.